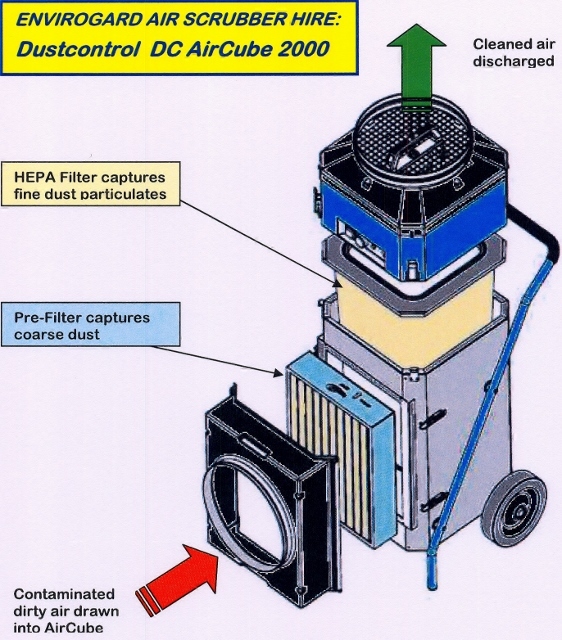 An air scrubbing unit ideal for capture of medium through to very fine airborne dust particles, the Aircube 2000 employs a large HEPA filter (located in the central core of the machine) which works in conjunction with pre-filters (contained in the removable black casing) to remove dust particles down to 0.3 micron diameter. Air is drawn through the user changeable pre-filter first, and after it has passed through the HEPA the cleaned air is discharged from the top discharge spigot. Pre-filters can be removed and replaced simply by un-clipping the black filter housing. 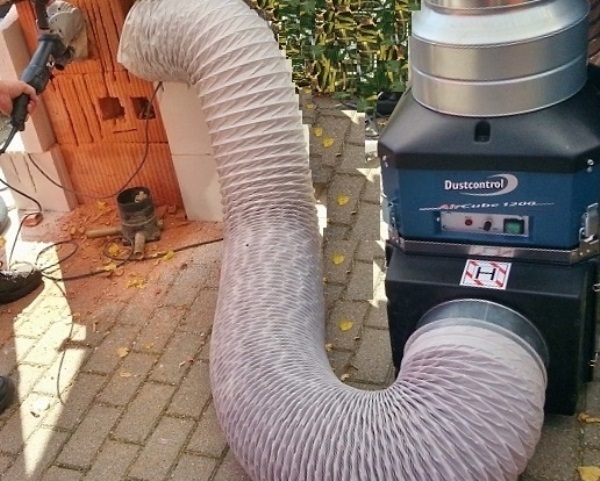 ► freestanding as an air "scrubber", returning the cleaned air to the room, as shown in the top image. ► for spot extraction, with the option of a separate "roving" head - as shown in the bottom image. ► to create a negative-pressure enclosure by extracting air from a room or enclosure and discharging it outside. 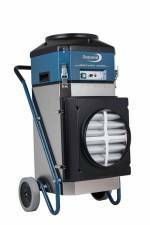 The principle of a negative pressure enclosure is that you create an area which is at a lower pressure than its surroundings, and the surrounding (usually cleaner) air infiltrates into the enclosure; this helps ensure that airborne contaminants remain confined to one area. The extracted air is removed from the enclosure by the air scrubber and filtered to remove airborne particulates, before being discharged "clean" to the outside environment. This equipment is "roll-up, plug-in, and switch-on", with a variable fan speed so it can be adjusted to suit the size of your room. Its' low noise level and makes it a good option for use in shops, workshops, warehouses and even offices.